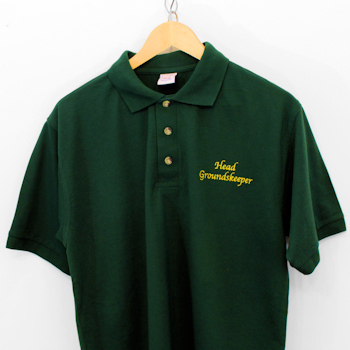 Embroidered polo shirt with any name or text of your choice such as a name, initials, company name or a brief moto. Fine quality polo shirt great for workwear and casualwear. Polyester cotton mix that is soft and comfortable to wear. Rib knitted collar and cuffs with matching buttons on a three button placket. 65% Polyester / 35% Cotton with a 210g weight.